Cloudz Plush Animal Neck Pillows - Cat by Cloudz at Animal Backgrounds. MPN: PIL-033821-CAT. Hurry! Limited time offer. Offer valid only while supplies last. Your child's next best friend! 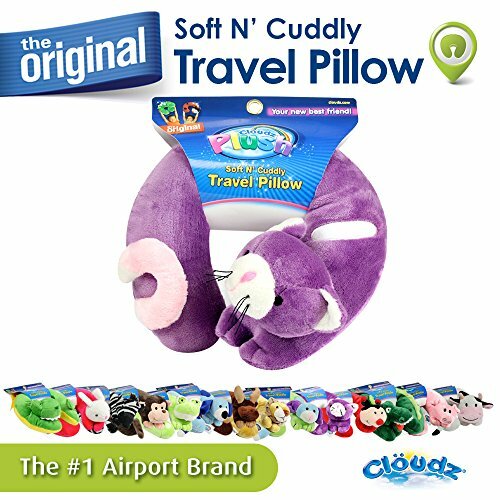 Our Clöudz Plush Cat neck pillow is super soft, cuddly, cute, fun and functional! Great for fun at home or on the go! Your child's next best friend! Our Clöudz Plush Cat neck pillow is super soft, cuddly, cute, fun and functional! Great for fun at home or on the go! Kids love the snuggly support and companionship our pillows offer for trips in the car, on a plane, train, or bus. Filled with soft and supportive, premium polyester fiber. You'll see why our plush friends are a favorite of kids and moms everywhere - collect them all! Our pillow can be machine washed and tumbled dry on low. (Sized for Kids) Clöudz is the brand you can trust. We've been helping travelers around the world to have a more comfortable and positive travel experience for over 15 years. Helps to keep kids entertained at home or on the go. Filled with super soft, yet supportive premium poly fill. If you have any questions about this product by Cloudz, contact us by completing and submitting the form below. If you are looking for a specif part number, please include it with your message. Disney Pixar Finding Dory Plush Pillow Buddy, 20"
Pillow Pets 01201408H Disney, Rolly, Stuffed Animal Plush, 16"